Given the family history, I was determined to get Munchie in the water ASAP. At one point, I even considered a water birth… but then I realized I wouldn’t be able to have drugs… and the thought bubble quickly popped. We would just have to wait for the pool. Well, last weekend (Saturday, July 27… to be exact), the day had come. My c section incision was healing up nicely and I gave myself medical approval to get in the water. (I might not be a doctor… but I was pretty sure mine would be giving me the thumbs up pretty soon anyway.) 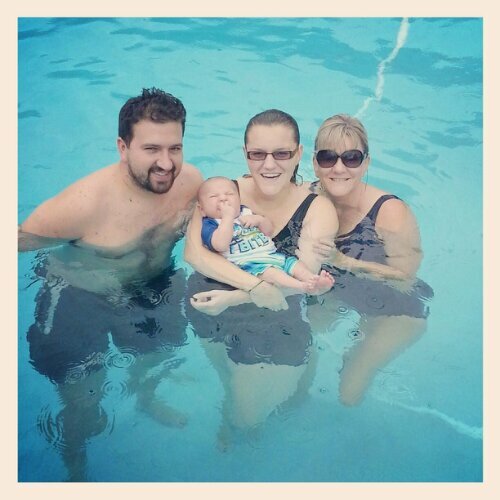 We loaded into the car, drove out to my parents’ house, got 6 week old Munchie in his swim gear (size 6 months, but it fit perfectly), and headed outside. I took Munchie in my arms and began our descent into the warm water. WOO HOO!!! He loved it!!! He immediately jumped from my arms and started swimming all around like a little fish. Sike. Just making sure you were still with me. He did float on his back (with some help) and kick around a bit, though. I am beyond thrilled that our first swim was a success! I’m sure by the end of next summer, he will be swimming on his own. You might say it’s a long shot… but I have big plans for our little man. SWIM, MUNCHIE! SWIM!